The Extensive Reading Foundation is delighted to announce that the 2017 recipient of the John Milne Innovation Award for services to Extensive Reading is our own Chair of the Extensive Reading Foundation Board, Thomas Robb. 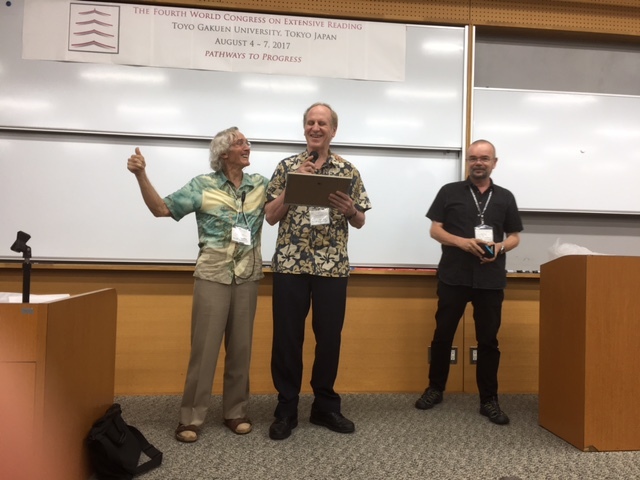 The award was presented by Professor Richard Day, the co-founder of the Foundation, at the Extensive Reading World Conference 4 at the Toyo Gakuen University in Tokyo on August 7th this year. Tom’s contribution to Extensive Reading is huge; he is the creator of M-Reader, an on-line aid to schools wishing to implement an extensive reading programme, and he is a tireless advocate for ER at TESOL conventions worldwide. His wisdom, knowledge and enthusiasm have been major forces in making the Foundation what it is today, and in driving the latest very successful ERWC4. Although Tom has officially retired from Kyoto Sangyo University, there is no doubt that his work will continue to guide and influence Extensive Reading globally for many years to come.